Thanks to the wide variety of dog harnesses available today at places like EzyDog, you can find one that perfectly fits your pet. Available in a huge variety of materials, styles and sizes, everything from multi-purpose harnesses to those designed for a specific use, like training, are there for you to choose from. The choice can be a little overwhelming, even for seasoned dog owners. The most important things to look for in a dog harness are safety and comfort for your dog, as well as convenience and comfort for you. Fit is the crucial factor in choosing the right harness for your pet. You should be able to get a couple of fingers between the harness and your dog to make sure it’s not too tight. A harness that’s too tight can actually prompt your dog to pull more than normal in an attempt to get away from the irritation of the straps. If you can fit more than two fingers between your pet and the straps, the harness is probably too loose, raising the risk that your dog could pull and slip out of it. If you have a very large or tiny toy dog, buy a harness designed specifically for that size. While many harnesses are adjustable to fit most sizes, getting one designed to fit your pet as closely as possible is best. A tiny dog fit into a regular harness may have a lot of straps leftover once it’s fitted properly. This can just be a way to catch on things, or even become something for the dog to trip or chew on. Harnesses designed for easy fitting usually have one buckle or attachment point to make it easy to get on and off your dog. These work well in most cases, and are perfect for pets on the go. If your dog pulls on the leash or has behavioral problems, this type of harness might not be the best choice. But for most pets’ general walks and trips outside, an easy-fit harness is often a good choice. 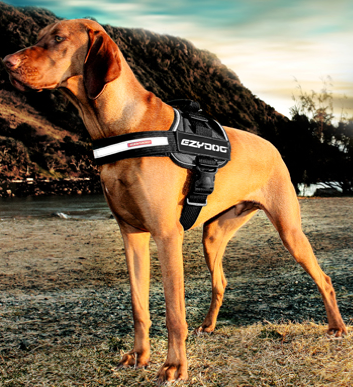 Harnesses with a chest plate like you’ll find at EzyDog are ideal for dogs that struggle against the leash. The gentle pressure applied by the chest plate can both make your dog feel more secure and may help to discourage him from pulling. Make sure the chest plate isn’t a scratchy or hard material that could irritate your dog’s skin. Pair it with a good leash like the shock-absorbing leash, and even a dog who tugs will be far easier to walk and train. With any type of dog harness you choose, be sure you know how to use it and that it’s easy enough to get on. This will help your dog recognize it as part of a fun day out instead of something to dread.